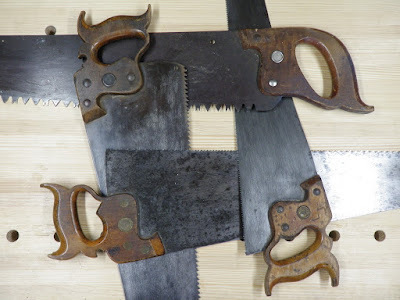 When your significant other asks how many ratty saws you need, you can see the answer here: four (at least for ripping, you should have at least two more for crosscutting)! Clockwise from bottom right, 8, 6, 4 1/2, and 2 ppi. For heavy work, the 4 1/2 is good for starting the cut and establishing the kerf for the big one. On the scale of coarse, medium, and fine, it's a shredder! Even at that size, you can still steer the cut a bit if you need to adjust it. 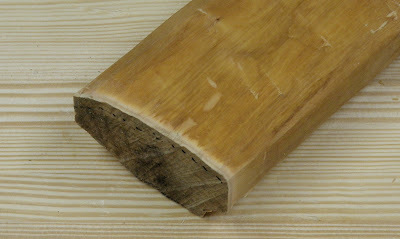 Having split the main body of the log, continuing with the other cuts. It's much easier to clamp in the vise now with a flat face. 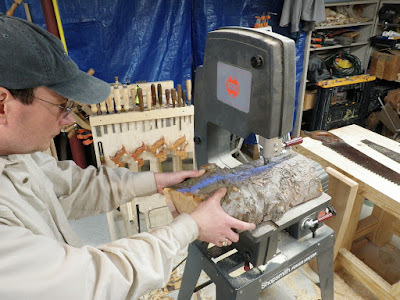 As with any resaw operation, alternate working the piece from each side. Showing an alternate grip and body mechanics. This allows you to swing the saw through with shoulders and a bit of torso twist, giving your elbows a rest. Finally, flip it end for end (with a kerf-keeper in the far end) and finish it off, again alternating sides. The resulting stack of flitches, with a 24" folding rule for scale. Remember those rough-hewn billets? Time to work on them. 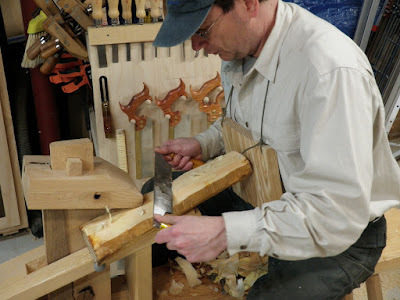 Shaving the pith from a rough-hewn billet, with the drawknife used bevel-down. I'll rotate the billet to shave the sides. 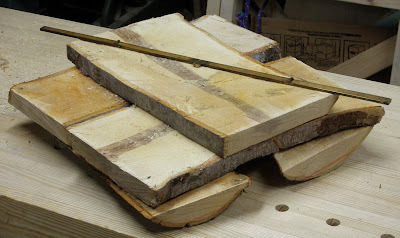 I built this shaving horse from Drew Langsner's books back in 2006. It was my very first all-hand-tool project. The foot-operated head makes it fast and easy to release and reclamp the piece when rotating it or flipping it end for end. Why the wooden bib? That's not a bib, it's body armor! Green wood is slippery. The first time one slips out and punches you in the sternum, you'll understand. Debarking. The green bark peels off easily. That exposes the wood underneath to the air for drying. 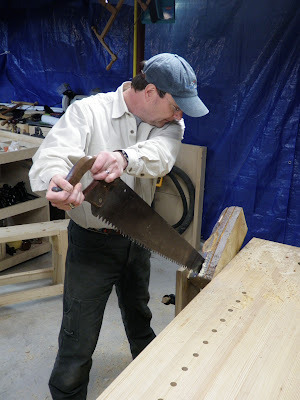 Using the chest-guard as a bearing plate to help hold the billet in place as I shave off the sapwood. The billet ready for stacking. It's roughly squarish. I could spend more time to shape it perfectly, but there's no need. I want to remove as much as possible now to minimize drying time for the rest, but still leave as solid piece as I can. Precision shaping can come when I make something from it in a few years. 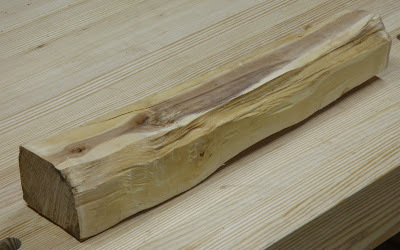 For comparison, here's a billet from a smaller diameter log that I rived and shaved two days earlier. That's when I decided I should rough-hew the initial corners, reducing the shaving effort. The moisture coming to the surface makes it look like it was in the rain. Note the dry end. Three months after felling and bucking, only the first quarter inch has dried. The dotted line shows the sapwood boundary. 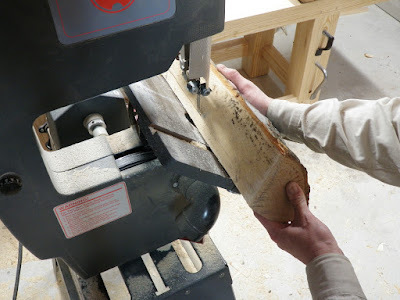 The final method was quartersawing on the bandsaw. Yes, burning electrons. 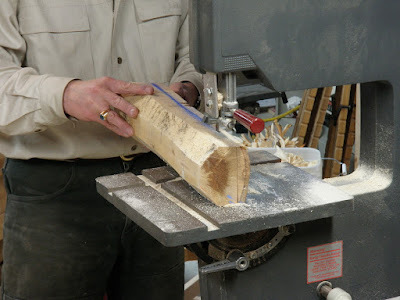 If there's one place where power tools are worth it, it's in handling rough timber. 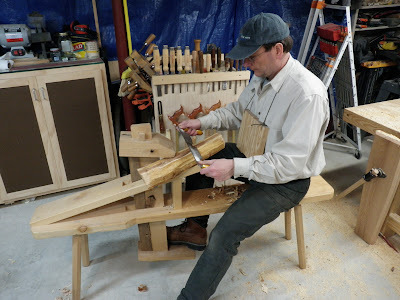 They can save hours of tedious labor that can be better spent doing fine joinery by hand. However, my Shopsmith bandsaw doesn't have a big enough throat, so this had to be a hybrid operation. 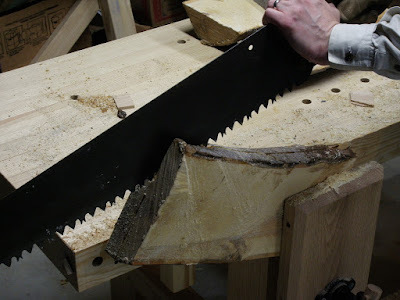 I sawed the log in half as above for flitch-cutting. I could have rived it in half more easily, but sawing leaves a flatter, smoother face for the bandsaw table. 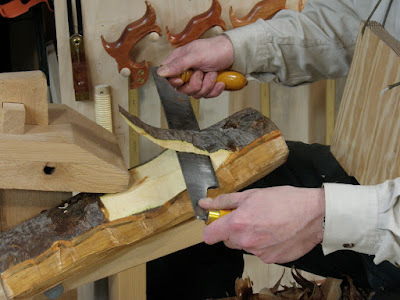 Riving, then coarse flattening with a scrub or fore plane is also an option. It took me 45 minutes of sawing to rip the log down the center, pausing only to flip it periodically. I got my workout today! Once you get into the rhythm, this is steady aerobic work, much like swimming laps. Varying the position reduces the risk of repetitive strain injury (take it from an old lap swimmer). The challenge bandsawing green wood is the random shape and rough bark. You can't fence it, and there's no single good height setting for the blade guide. You just have to snap chalk lines on the piece based on where the pith appears at each end and free-hand it, using a wide blade. Sighting across the length to line up the chalk line with the blade helps. 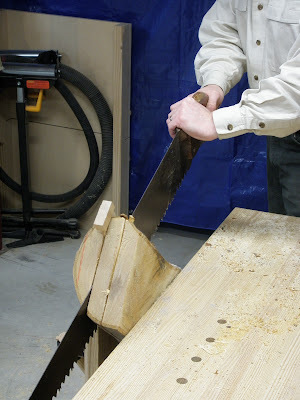 This method would also work for flitch-cutting the halves on the bandsaw. The piece can be guided along a fence once a flat face has been established. Pushing one of the halves through. Pulling it through the remaining distance. The four quarters. The pith was actually a little off center, so these aren't perfect wedges. Trimming the pith. With the table at an angle and no fences or guides, this becomes a little riskier. Trimming the side. Like the rived billets, this is going to be an approximately squared-up quartersawn blank. At this point there's probably a good enough flat on the side of the piece to allow a fence. The final cut to remove the sapwood and bark. 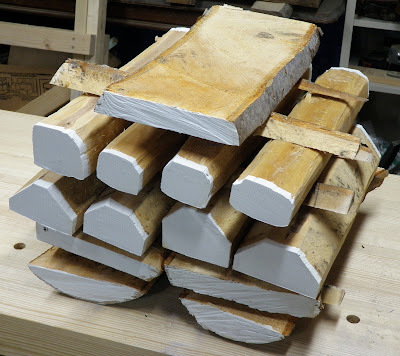 Comparing the two rived and shaved billets with the four sawn quarters. For the final steps, since I had the bandsaw set up, I did a fresh cut on each end to square them off and trim the cracked dry portion. Then I coated the ends with exterior latex paint. Once it dries (if it ever does, given the moist substrate), I'll mark the ends with batch and piece number. That'll allow me to keep a list tracking processing date and method along with species. 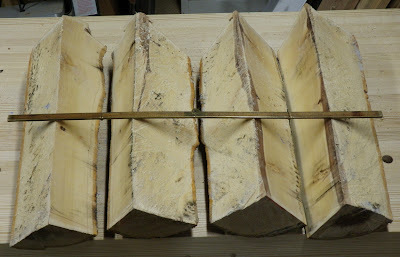 Three logs, processed, stacked, and stickered with bandsaw trimmings. I'll have to find an out-of-the-way spot for these to season for the next three or four years. I still need to debark the two outer flitches, and I'm debating debarking the edges of the other ones. So was it worth all the effort? 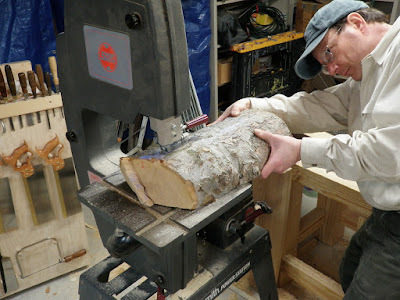 Yes, for a small-scale operation, I'll have some nice stock to work with, and the added satisfaction of knowing I took it from the raw felled tree. I'll continue to process the additional pieces over time. It's clear from the minimal end drying that I don't have to rush it, although winter drying is probably much gentler than spring and summer drying. 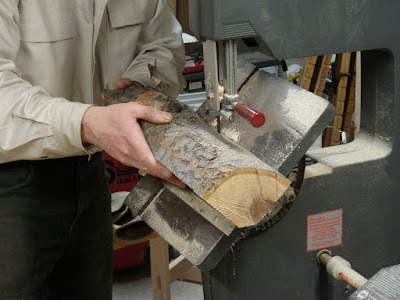 Look here,how I slice fruit timber at my small bandsaw.